Cheesecake recipes can seem quite intimidating. Use a “spring-form” pan, process in a “water-bath”, bake until “slightly wobbly”. For a long time, I had no desire to tackle this delectable it-must-be-a-special-meal-if-they’re-serving-cheesecake kind of dessert. I mean, there is a high-top restaurant named after cheesecake, for crying out loud! But after a friend counseled me on the pleasures of baking this star confection, I decided to give it a try and you should too. The worst that can happen is a crack in the top of the cake, and so what? If your cheesecake cracks, just spread whipped cream, fruit or sour cream over it. Okay, actually the worst that can happen is the foil you have wrapped around the pan will get a tear in it and the water bath may seep in to make the crust mushy or solid from too much liquid. Solve this by not sliding the foil-wrapped pan in and out of the oven when baking the crust, or better yet, forego the foil and place the spring-form pan in another larger baking dish that you then place into the roasting pan which will hold the water. If you’ve never made a cheesecake before, go and buy yourself a 9-inch springform pan and get started. 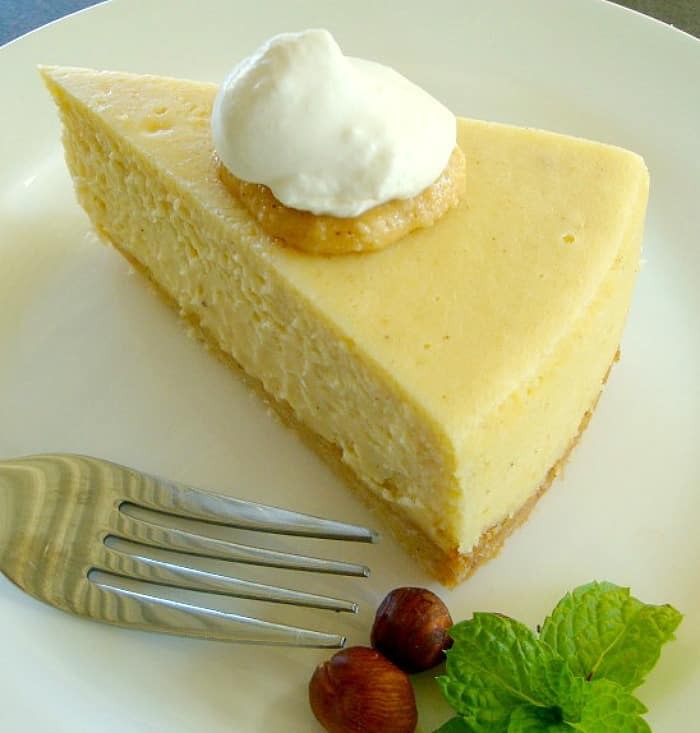 Hazelnut Vanilla Cheesecake is light and has such a smooth, creamy taste. The mild hazelnut praline paste blends perfectly with the pure vanilla extract. It really is fool-proof, though the process of making the praline paste takes just a bit of time. I would make the paste days ahead (here is the recipe) and then the day of baking your cheesecake will really be a nice, relaxing experience. 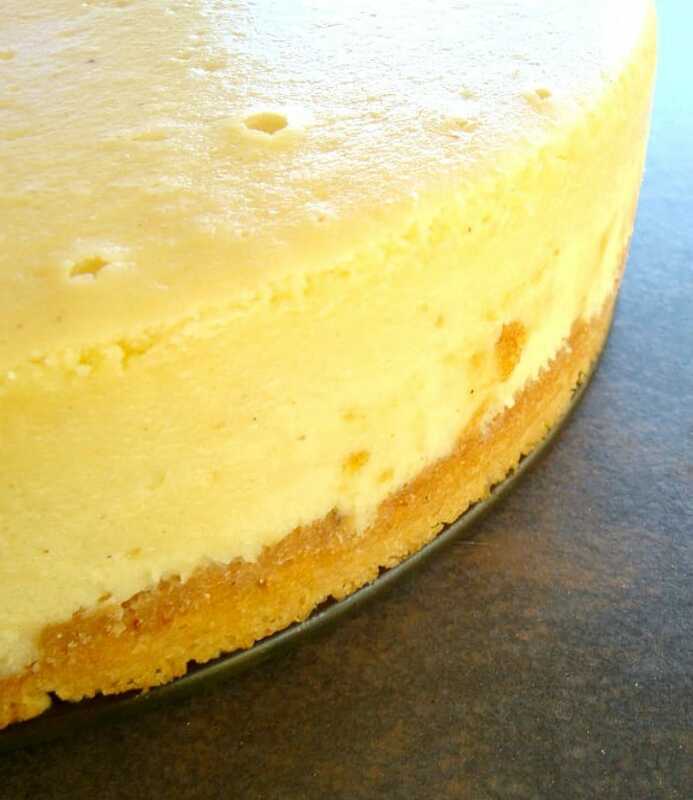 One additional note on a secret to better cheesecake; many recipes say to refrigerate at least 4 hours before serving. I think it is imperative that your cheesecake remain in the fridge overnight before first serving. The difference in flavor intensity and texture is quite significant! So plan accordingly. 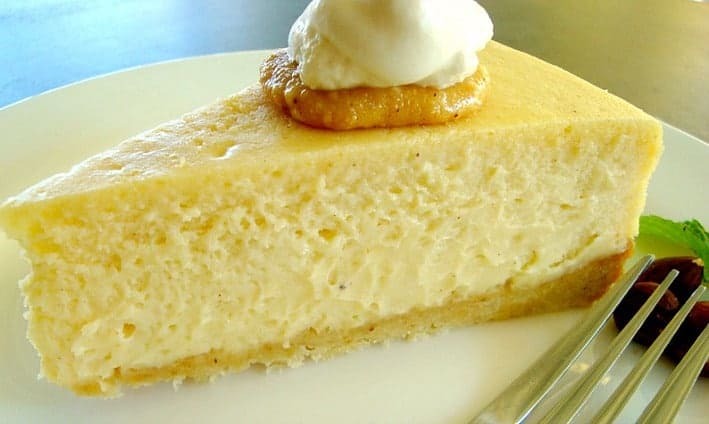 A nice variation on classic cheesecake, serve with extra praline paste, whipped cream, or your favorite fruit topping. Hazelnut praline paste added to this creamy and smooth cheesecake compliments the vanilla perfectly. You can buy commercial praline paste or make it from scratch. Position a rack in the center of the oven and preheat the oven to 350F degrees. Lightly grease the bottom and sides of a 9x3-inch spring-form pan. Cut an 18-inch square of heavy-duty aluminum foil and wrap the foil around the outside of the pan. Place the flour, hazelnuts, confectioners' sugar, salt and baking soda in the bowl of a food processor and process until the hazelnuts are finely ground. Add the butter pieces and process until the dough begins to come together. Press the dough into an even layer in the bottom of the prepared pan. 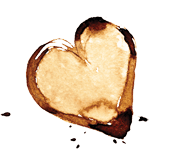 Bake the crust for 25 to 30 minutes, until it is just beginning to brown. In a medium mixing bowl, beat the cream cheese at medium speed until creamy and lump-free, about 2 minutes, scraping down the sides of the bowl as necessary. Gradually add the sugar and beat until blended. Add the praline paste and mix at low speed until well blended and no lumps remain. Add the heavy cream and vanilla extract and mix just until combined. Add the eggs one at a time, mixing well after each addition and scraping down the sides of the bowl as necessary. Scrape the batter into the cooled crust. Place the pan in a roasting pan or large baking pan. Pour enough hot water into the roasting pan to come 1 inch up the sides of the springform pan. Bake the cheesecake in the water bath for 60 to 70 minutes, until the center of the case is set but slightly wobbly (the cake will set completely as it cools). Remove the cake pan from the water and immediately run the tip of a paring knife around the sides of the pan to prevent the top from cracking. Transfer the pan to a wire rack and cool the cake completely. To serve, slice the cake with a thin-bladed sharp knife, wiping the knife clean between each cut. Serve with whipped cream and/or extra praline paste formed into a disk on top. Recipe adapted from one of my favorites, The Cake Book by Tish Boyle. This totally looks doable! Thanks!